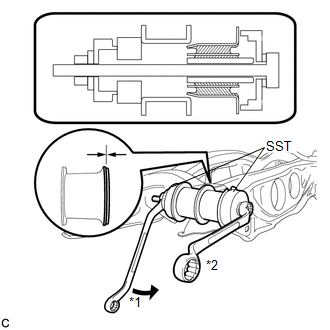 (a) Using SST and a socket wrench (21 mm), install the stud bolt. (a) Temporarily install the rear No. 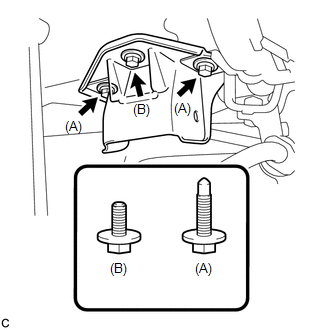 2 body mounting bracket sub-assembly LH with the 2 bolts (A) and bolt (B). Two types of bolts are used. Install each bolt to the correct position. (a) Install the 6 hole plugs. (a) Temporarily install a new rear suspension member body mounting front cushion while confirming the installation direction. (b) Using SST, install the rear suspension member body mounting front cushion until there is no clearance between the suspension member sub- assembly and the rear suspension member body mounting front cushion. Install the side marked "F" of SST to the body mounting cushion. 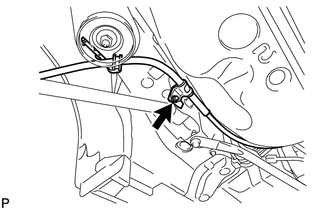 (a) Temporarily install a new rear suspension member body mounting rear cushion while confirming the installation direction. 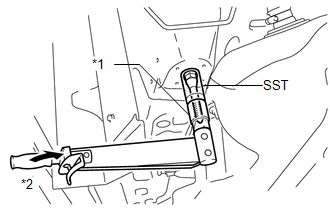 (b) Using SST, install the rear suspension member rear body mounting cushion until there is no clearance between the suspension member sub-assembly and the rear suspension member body mounting rear cushion. 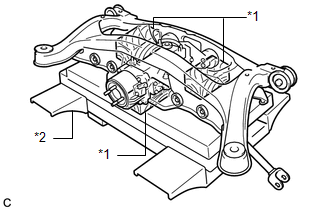 (a) Support the rear suspension member using a jack and 3 wooden blocks as shown in the illustration. 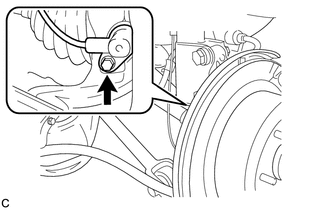 Support the rear suspension member until retightening of the suspension member is complete. 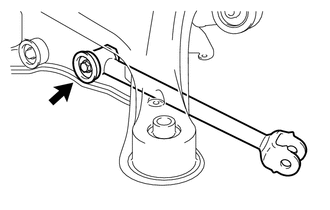 (b) Raise the rear suspension member using a jack with wooden blocks. 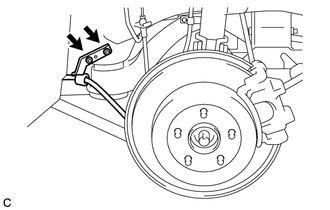 When raising the rear suspension member, be careful not to damage the vehicle body or other components installed on the vehicle. 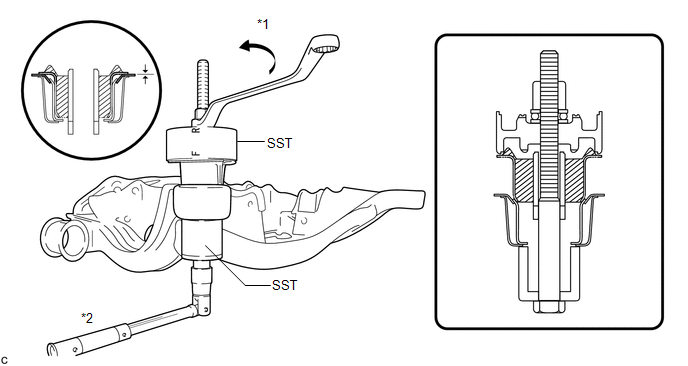 (c) Temporarily install the rear suspension member, 2 rear upper suspension member stoppers and rear lower suspension member stopper retainers with the 2 nuts (A), 2 nuts (B) and 2 bolts. 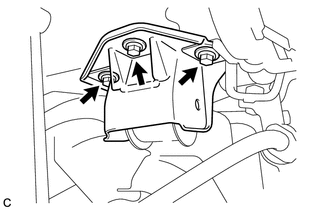 Be sure to install the rear suspension member with the rear upper suspension member stoppers and the rear lower suspension member stopper retainers in the correct direction shown in the illustration. (d) Fully tighten the 2 nuts (A). 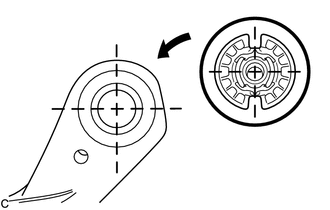 Fully tighten the nut (B) after fully tightening the rear No. 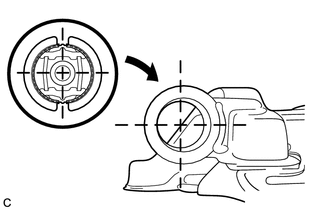 2 body mounting bracket sub-assembly in the following steps. 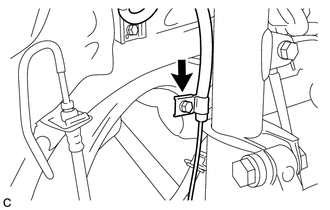 (a) Lightly shake the rear suspension member to settle the body mounting cushion in the rear No. 2 body mounting bracket sub-assembly. (b) Fully tighten the 3 bolts. 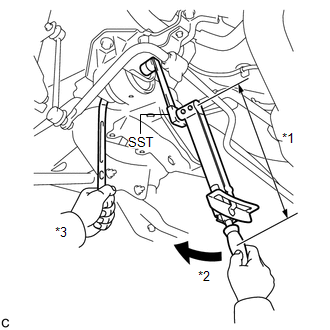 (a) Using SST and a socket wrench (19 mm), fully tighten the 2 nuts. Perform the same procedure for the RH side and LH side. (a) Engage the 6 clamps, connect the connector and the hose to install the frame wire. 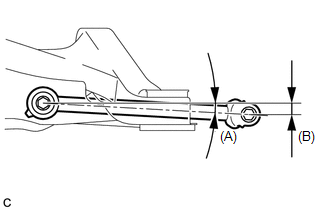 (a) Engage the clamp to install the No. 3 floor wire. (b) Install the No. 3 parking brake cable assembly with the 2 nuts. 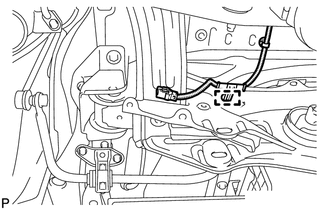 (a) Install the rear speed sensor LH to the rear shock absorber with coil spring with the bolt. 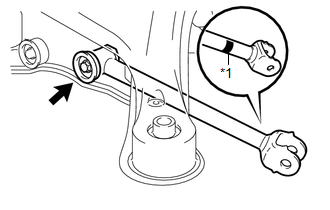 (b) Install the rear speed sensor LH to the rear axle carrier sub-assembly with the bolt. 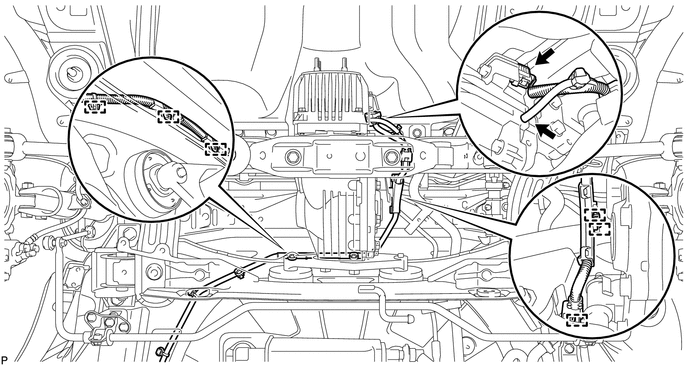 Keep the rear speed sensor tip and sensor installation hole free from foreign matter.